21 ⅜ x 29 ½ in. Jan ten Compe found his calling in painting views of major Dutch towns. His paintings are so precise that they are of special interest to historians because of their topographic and architectural accuracy. He rendered buildings in minute detail, adding daily activities to enliven the scene. Bathed in morning sunlight, the turreted building dominates Nieuwmarkt Square in Amsterdam. 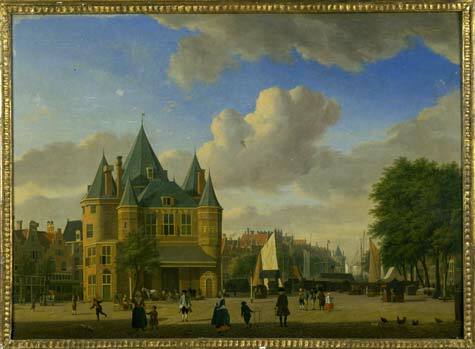 Originally built as a city gate, the stately structure became a Waag, or weigh house, in the 17th century. A small group of men load several large bags onto a scale in front of the weigh house and the skeleton painted on one of the doors of the weigh house indicates the entrance to the meeting room of the Amsterdam Guild of Surgeons.